Do you feel stuck in the hips? Tight or restricted? Do you round your shoulders or fold at the waist when in jumping position? Do you tense your hips when turning or try to shove your seat around? This exercise should help you improve your awareness of your hip joints and how to move at the hips for riding on the flat, jumping and turning. In previous Murdoch Minutes I have described how to find your hip joints. Most people identify the top of the pelvis as their hips but this is not where the joint is located. The hip joints are where your leg meets your pelvis. This distinction is extremely important for riding because making small changes in your hip function has a huge impact on your horse. If you act as if your hips are the top of your pelvis you will not function as efficiently as you will when you are clear about their anatomical location. I have my right hand and wrist on my right thigh. I am sliding my hand along my thigh and off the end of my knee while folding forward at my hips in order to let my forearm touch my thigh. I have slid my hand down to the floor and am washing the floor around my right foot. My knees and feet are wide enough to allow my body to fold down between them. Begin by sitting on a flat surface with your feet flat on the floor. Ideally the height is so that you have a right (90 degree) angle at the back of your knee. Have your feet a little more than shoulder width apart. Rest one hand on your thigh. Depending on the length of your waist you may also be able to rest your forearm as you see me doing in the photo 1. Slide your hand along your thigh toward your knee. Notice if you are folding at your waist or at your hips. If folding at your waist you will not be able to slide your arm very far. If folding at your hips you will be able to slide your arm forward off your knee all the way to your elbow. Slide your arm back until you are upright. Slide your hand down your thigh and follow down the front of your calf to your ankle. Notice that you have to let your seat bones go back as you do this. If you can, place the palm of your hand on the floor. If only your fingertips touch that’s ok. You may find that as you explore you can place more of your hand on the floor. Wash the area around your foot. Make sure to relax your belly otherwise you may not be able to breathe! Follow along your leg as you come upright. I am reaching across to the opposite foot. My lower back is flat and I have folded at my hips while keeping my feet flat on the floor. Slide down the thigh, calf and foot until your hand is on the floor again. Move your hand so that you are washing around your other foot. Your lower back will be flat (it may feel slightly hollow). Allow yourself to look at the floor so that you do not strain your neck. Slide your hand up the calf of the opposite leg as you come upright. Notice that in order to wash the floor around the opposite foot you have to allow the pelvis to move around the ball of the femur. This is what needs to happen for turns. The hip sockets move in relation to the head of the femur (ball). Repeat the exercise with the other hand. Only do one hand at a time. Are they two sides the same? Is one easier than the other? Do you let your seat go back as you fold forward (as you should for jumping)? 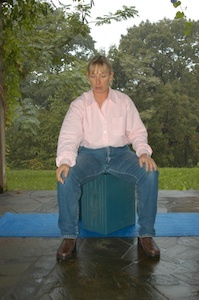 Alternate between your two sides (right arm on right leg crossing to left foot coming up left leg, left arm down left leg crossing to right coming up right leg) to make both sides more similar.Use this Murdoch Minute to improve your sense of folding at your hips for jumping, and moving your pelvis for turns. Practice for a few minutes before mounting your horse to remind yourself where your hips are and always remember to enjoy the ride!